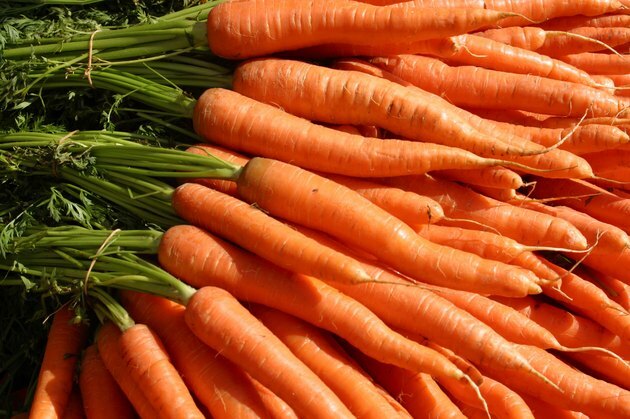 Beta-carotene is an orange-colored plant compound found in many fruits and vegetables, especially carrots. Like all other carotenoids, beta-carotene is a strong antioxidant capable of scavenging potentially harmful free radicals. Your body can convert beta-carotene into retinol -- commonly known as vitamin A -- if needed. The absorption and conversion of beta-carotene depends on many factors. In addition to carrots, excellent sources of beta-carotene include watercress, pumpkins, winter squash, sweet potatoes, yams, apricots, papayas and mangoes. Dark green leafy vegetables such as spinach, kale and broccoli are also very good sources. The beta-carotene content within fresh produce varies greatly and depends on soil composition, time of year, ripeness and exposure to light and oxygen. Beta-carotene is called a provitamin A because your body can convert it into vitamin A or retinol when storage levels in your liver are low. Other carotenoids such as alpha-carotene also can be converted. Once in your small intestine, beta-carotene is cleaved or cut by a specific enzyme into two molecules of retinol. The conversion and absorption efficiency of retinol is relatively low -- between 9 percent and 22 percent -- and depends on many factors, such as the need for vitamin A, intestinal health, bile production and the amount of dietary fat in the intestines. Retinol is a fat-soluble vitamin, which means it needs some fat to be absorbed and stored in the body. If retinol is not needed by your body, beta-carotene is not cleaved in half within the small intestine. Instead, it's absorbed intact and stored mainly within subcutaneous fat just beneath your skin. Vitamin A used to be measured in international units, which was fine to account for retinol from animal-based foods or supplements, but a new measurement was created to account for your body's ability to convert beta-carotene and other carotenoids into retinol equivalents. The conversion agreed upon by American researchers is 1 retinol equivalent equals either 3.33 international units of vitamin A activity directly from retinol or 10 international units of vitamin A activity from beta-carotene. In other words, retinol from meat or supplements is estimated to be three times more efficiently used as vitamin A by your body compared to beta-carotene from plants or supplements. This conversion is only an estimate because of the cleavage and absorption variability in the small intestine. Although beta-carotene is not the most efficient way of providing your body with vitamin A, it's much safer than taking retinol directly. In large doses, retinol can be toxic, whereas beta-carotene is non-toxic in its natural form and not converted to vitamin A unless your body needs it. You cannot overdose on beta-carotene. The main downside to taking too much beta-carotene is that your skin may temporarily turn orange -- a condition called carotenosis.